When last I posted I had a partial swatch. I have since finished that and soaked and blocked it to get an accurate gauge. I then also swatched in stockinette before determining my final cast on number. I have almost 8” complete and I think that is about right for the border pattern. At first I thought I might make it more like 10-12 “ deep, but it is looking right to me now so I will probably make the transition. 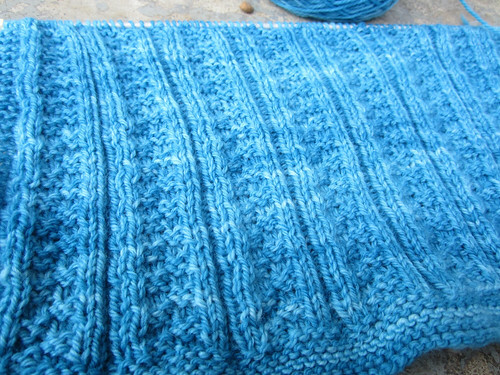 I am aiming for this to use 2 skeins of my Classic Merino Sport yarn. Initially I had planned two stitch patterns; one on each end for a deep border and one for the main body. 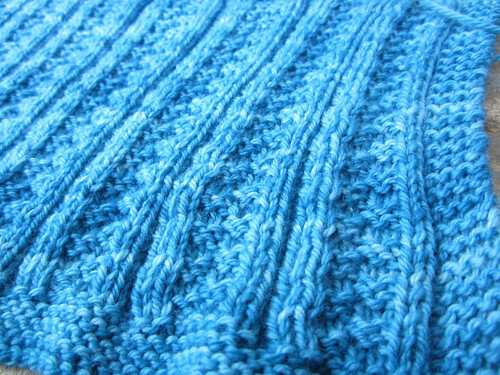 As I knit however, I begin to think I may want to add a third element as a small line between the two as a transition. I am going to pore over my stitch pattern books today and see if anything inspires me that will both harmonize with what I have going and will also work out in multiples of the stitch count on the needles. We will see if anything comes of it or if I proceed with my original plan. Oh and speaking of new designs, my new website is up and running with only a few minor glitches. Yay! Glad that is done. I love it and hope you all will find it a much nicer experience than the old one. One more big thing off my to do list is my federal income tax return. Whew! Man I hate doing it every year, don’t you? I try to get it over with ASAP and as soon as the website was done I decided to tackle the taxes so I could just focus on upcoming show preparations and my new design work. I have one other design idea percolating and I started a swatch for it too. So far it’s just a little stockinette swatch in my Classic Merino Bamboo. I didn’t bother with a picture yet since I haven’t picked out the stitch patterns to embellish it with yet and so it’s not too exciting to see. I can tell you that it will be a little dress, inspired by my newest grand daughter to be born in May. More details in it as they develop.